No, this isn’t how not shiver your timbers or how to prepare to be boarded, or advice about avoiding keel-hauling. This page was written specifically for writers (and other artists/musicians/holders of copyright) whose intellectual property is being illegally downloaded – STOLEN – and aren’t sure what to do, or even if there’s anything they CAN do about it. Worry not. If you find your work has been uploaded illegally and is being downloaded illegally, rest assured, there is something you can do about it. 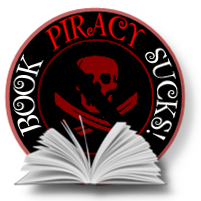 This page is about what to do/how to get started combating the piracy of your work. Combating e-piracy is complicated, time-consuming and annoying, but this is how it has to be done. The first time is the hardest to figure out and send, but it’s worth it. Update: There’s a website out there called Muso.com that will, for a nominal fee, take care of the majority of the instructions below for you. If you’re in the creative industry and concerned about online piracy of your work, check them out and see how they can help you. If you’d rather take care of things yourself, read on. Special thanks to Skyla Dawn Cameron for providing me with my own “how to,” and for permission to share what she taught me here. First and foremost, you have to get the individual links to the files in order to send takedown notices (remember when I said this was time-consuming?). Take the DMCA notice you’ll find below, fill it in with your info (and save it as a file, as you’ll use it over and over again) and add the file links in the spot that requests URLs to the violating material. Then send the complaint to the abuse e-mail or contact form you find on the pirating site. 3) Send the notice to the “abuse” or other takedown contact for that site/forum. It’s that simple – and that complicated. Pirating sites don’t make it easy to find their info, but it’s there somewhere, usually in tiny print at the bottom of the page in “contact us” or their FAQ or “policies.” If you can’t find where to send your notice, take a look there. Don’t be surprised at how hard a takedown address/contact is to find. Some sites even have policies stating that they don’t respect or recognize DMCA/takedown notices. Some you have to join to send mail/messages/notices. Others have their links set up in forums just for this reason – that is, so they can ban people like you spoiling their fun. For the forums (again, you may have to join to participate in these), if they link to the illegal file, you can send a notice to the board administrators to have it deleted. They encourage piracy, but if you send them a DMCA they’ll generally (read “should”) comply. Too many authors seem to have the opinion that they should just be quiet and not rock the boat. If that works for you, fine, but I’m not about to sit by and watch people steal from me. If ALL of us went after these people, they’d slink into the shadows and quit. But they’re not going to do it without a fight. They do it because no one gives them that fight. Shine the light on the cockroaches and they scatter, but some of them turn and run after you. Be prepared to be screamed at, called names, told you’re wrong, have your work deliberately targeted and uploaded out of sheer spite, receive hate mail, suffer their sense of entitlement and deal with their denial. Some know what they’re doing is wrong and apologize for it/comply immediately. Others send you nasty e-mails telling you where to shove your DMCA notice because they’re not doing anything wrong. No matter what happens, harassing e-pirates is ugly and not fun. It’s not just a battle, it’s a war, and war, as is said, is Hell. You up for it? If you are, read on. Some sites comply. Other sites ignore you. Some sites are in other countries and don’t recognize a DMCA notice (this does not mean, however, that they are exempt from their own country’s laws, or that there isn’t another way around this – such as informing their ISP about what they’re doing – but that’s a subject for further personal investigation and not recommended for the purposes of this subject). Other sites tell you bluntly not to bother sending them any kind of notice at all because they’re not doing anything wrong/not the problem/not the host for illegal downloads/whatever (“We’re just a search engine! We don’t host the file! We just provide the links! You need to contact the poster directly! It’s not OUR fault! We tell them not to post illegal things!” ad nauseum. Funny how they scream that they’re not violating/don’t care about your copyright, yet at the bottom of their page there’s a copyright symbol along with “ALL RIGHTS RESERVED.” So copyright applies to them and they don’t want anyone stealing THEIR content, but it’s all right for them to do it to you. Do you think that’s fair?). It’s really hit or miss, but you do what you can, and how much time you want to spend doing it is really up to you. This does take time and effort – as I said, they don’t make it easy for you. You may feel that your efforts are futile – that the problem is too big for you to handle/bother with. That there’s nothing you can do to really make a difference. Yes, it’s a big problem, but you’re not alone, and in any fight, it takes just ONE person to stand up and say “NO.” Stand up for yourself, because if you don’t, no one else will. And once someone else sees you standing there, you’ll get company. Probably someone else who wanted to stand up but either didn’t know how, or wasn’t brave enough to do it alone. You’re not alone. Stand up. When you’ve done that, fight with us. There are more of us than you think, and even if we don’t win, we’ll certainly take a bunch of them with us when we go down fighting. One last thing: don’t let pirates – THIEVES – make YOU feel guilty for telling them to take down your work/harassing them about up/downloading it. THEY are the ones in the wrong, not you. THEY are the ones stealing YOUR work. Every argument they might offer you to justify their theft is no argument at all. NONE. There’s no reasonable justification for what they do, so don’t let them add insult to injury when you call them on what they’re doing to you.